I Am Sorry Messages for Husband: From romantic quotes, sweet texts, flirty updates on Facebook and the cutest pins on Pinterest – there are heaps of way in which you can apologize to him. You can even go over the top by writing a note on a greeting card and tell him how much you love him. Asking for forgiveness is all about showing that you are ready to go to any lengths to be taken back in his arms again. Whether you want to say sorry for fighting, arguing, nagging, disrespecting, lying or taking him for granted – keep poking him with one after another heartfelt apology until you put a smile on his angry face. Relationships are meant to go through highs and lows. If yours has hit rock bottom, don’t be disappointed. A few apologies, a few kisses and a few hugs is hopefully all it will take to set things right. 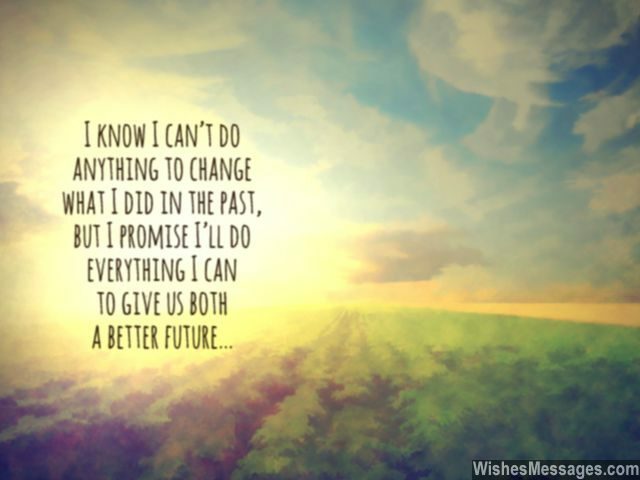 1) I know I can’t do anything to change what I did in the past, but I promise I’ll do everything I can to give us both a better future. I am sorry. 2) All I want from you are your hugs and kisses. That isn’t too much to demand, after all I am your Mrs. All I am asking for today is a little bit of forgiveness. Is that too much to ask for, after all I am your princess. I am sorry. 3) We have fought and argued. We have had many a bitter feuds. But what is more important is that we have risen above… after all, undying and awesome is our love. I am sorry. 5) Sorry for thinking that I was always right. Sorry for not considering your insight. 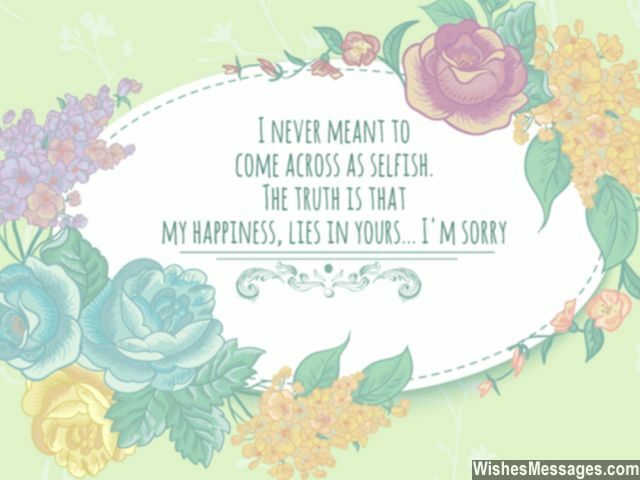 Sorry for always using my might… and thank you for loving me in spite. I love you. 6) Sorry doesn’t mean anything when I say it to the world. 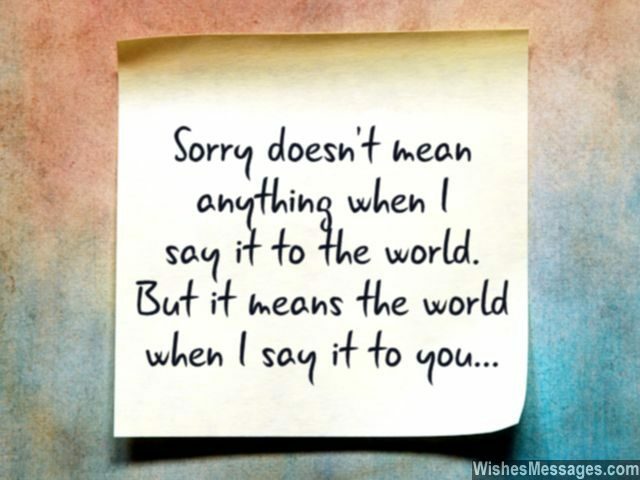 But it means the world when I say it to you… I am sorry. 7) Sorry for hurting you and making you feel bad. I swear that I want to be nothing but the feel-good factor in your life. I love you. 8) With responsibilities come rights. And since you have given me the responsibility to act more carefully next time, I have the right to demand forgiveness from you for this time. I am sorry baby. 9) Believe me baby, my lies are hurting me more than they did to you. 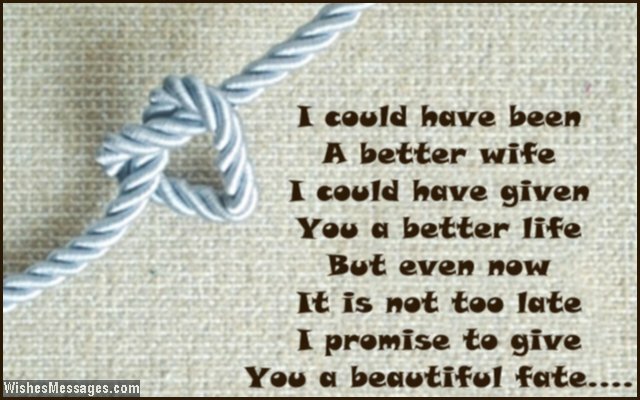 Despite our fights I love you no less than I do before… and I hope you do too. I am sorry. 10) The mistakes I have made have taught me many lessons in life. The most important one was the realization that I was lucky to be your wife. I love you. 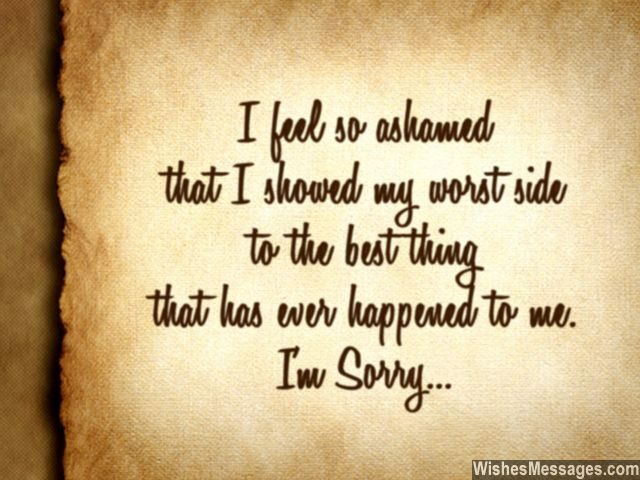 11) I feel so ashamed that I showed my worst side to the best thing that has ever happened to me. I am sorry. 13) Fact of our married lives: I always mean everything I say to you when I am in a good mood. But I never mean anything I say to you in a bad mood. Please forgive me. 14) I am the reason for all the severe headaches you had today. I promise to be your Aspirin and drive all the pain away. I am sorry. 15) I have always let you off the hook whenever you have apologized after leaving your dirty towel on the bed. Now it is your turn to return the favor by letting me off the hook for leaving you with my dirty lies. Sorry love. 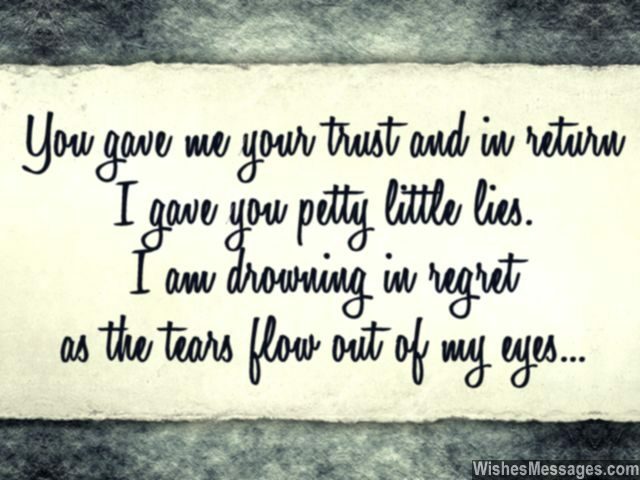 16) You gave me your trust and in return I gave you petty little lies. I am drowning in regret as the tears flow out of my eyes. I am sorry. 17) I am not sorry for fighting with you, relationships have their ups and downs. But am I sorry, that I fought with you for the wrong reasons. Please forgive me sweetheart. 18) Nothing can erase the lies that I have said. But I hope that watching me suffer and suffocate in regret will make you realize how sorry I am. I love you. 20) I wish there was an undo button in life so that I could press it and reverse the blunder I have made. But since there isn’t, I promise to never Redo the same mistakes again. Sorry for hurting you baby. 22) Cheating on you, lying to you and betraying your love… I would rather die than do any of these. Baby please don’t stress about our little misunderstandings. Nothing in the whole universe is strong enough to shake the foundation of our bond. I am sorry. 24) I am going to become a handywoman to fix all the leakages and repair all the cracks in our husband-wife relationship until it works smoothly like before. Sorry for everything my dear. 25) Mistakes and failures are supposed to make relationships stronger. I hope that my mistakes have made our marriage stronger and better than ever before. Sorry. 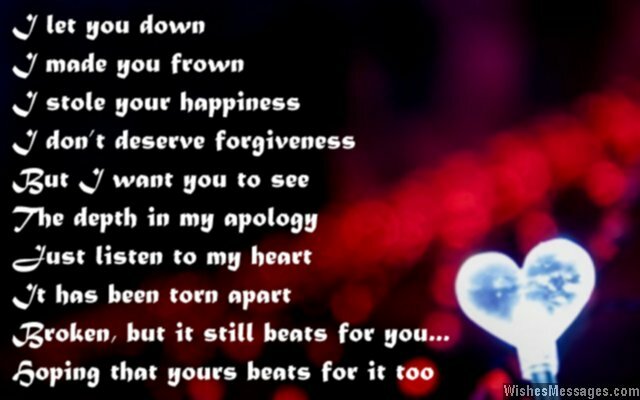 26) I let you down, I made you frown. I stole your happiness, I don’t deserve forgiveness. But I want you to see, the depth in my apology. Just listen to my heart, it has been torn apart. Broken, but it still beats for you… hoping that yours beats for it too. I am sorry. 28) Forgive me quickly, otherwise we will keep fighting and some other couple will claim the title of being ‘The happiest pair in the world’. I am sorry baby. 29) Please consider my mistake as a small pothole in the beautiful freeway of our married lives. I promise to fix it so we can cruise along again. I am sorry. 30) Wouldn’t you get jealous if you had the most expensive car in the world and some else took it for a ride every day? That is how I feel when I have the hottest husband in the world and all his pretty colleagues get to spend all day with him in the office. I am sorry for being so possessive, but I love you. 31) I could have been a better wife. I could have given you a better life. But even now it is not too late… I promise to give you a beautiful fate. 32) Apologies are better felt than said… so I want you to put your hand on my heart while I rest my head on your shoulders so you can feel how sorry I really am. I love you. 33) My mistakes brought about AGONY but I am going to fix everything with my APOLOGY. I am sorry. 35) Our fight last night was a LEARNING EXPERIENCE. I am LEARNING from the mistakes I have made, and I am EXPERIENCING regret because of the things I said. I am sorry. 36) My mistakes have sucked our love dry but I promise to replenish it with kisses. I am sorry. 37) I am sorry for being so jealous and possessive, but it is hard to control my feelings because my husband is the most handsome man in the whole world. I love you. 38) I don’t want you to forgive me just because I am apologizing to you. I want you to forgive me because you truly believe that I am capable of stopping myself from being a nagging wife. I am sorry. 39) I was so IMPULSIVE that my nagging behavior became came across REPULSIVE. Sorry. 40) I promised to never let anything come in-between us two… not even my own mistakes. So I will fix ever little thing I have broken in our marriage, no matter how long it takes. I am sorry.